As our plane came in for a landing at Reykjavik Keflavik International Airport on Iceland I looked out over the rocky volcanic landscape onto the unforgiving North Atlantic Ocean. From my reading of Iceland’s maritime heritage, I knew Icelanders fished year round. As a sailor I knew that a man overboard in winter had about ten minutes before losing consciousness. Having taken a fair number of risks on the water myself, I wondered what it would take to get me out in January or February aboard a frail wood Icelandic boat. Sitting comfortably in my warm airline seat, I realized only one thing – survival. In a previous article titled Viking Democracy, I explored how early Viking culture made a community life possible in a harsh land. That culture undoubtedly contributed to survival of the early settlers but I still wondered how they avoided starvation. Like the ultimate survivor scenario in a real life TV drama, the early settlers were completely cut off from the rest of the world. With a short growing season, no indigenous game or trees and few natural food resources, Iceland’s intrepid founders were literally facing starvation daily. What sustained them through the long cold winters? I got some answers in Reykjvik’s Old Harbor where the first Viking settlers landed in 874 AD. For eleven centuries Old Harbor Reykjavik has provided Iceland with a fragile sea link to the rest of the world and, as I learned, fishing was crucial to survival. Modern steel wheel house on an old wood hull in the Gullborg fishing trawler. 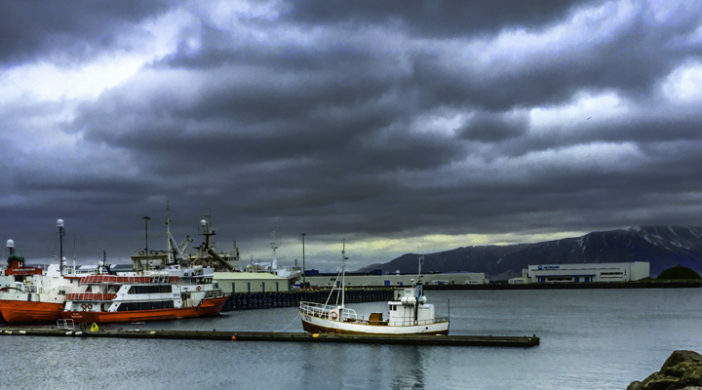 After the half hour drive from the airport, under a gray-blue stormy sky, I explored Reykjavik’s Old Harbor which offered an immediate glimpse of the island’s nautical past. Old 30’ wood fishing vessels rested next to modern 100’ steel trawlers. Marine railways and hauled-out modern behemoths sat next to old stone dry docks with fishing vessels from a bygone era. 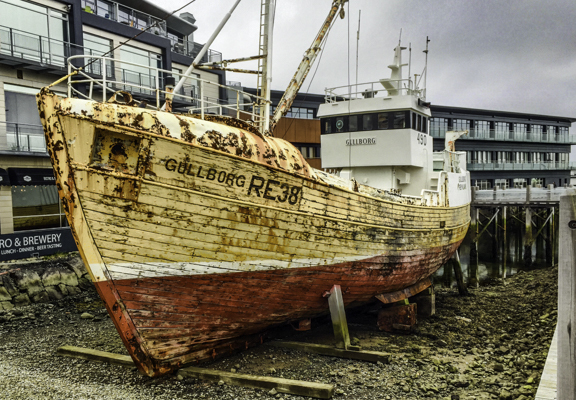 Iceland has no trees or lumber so fishing vessels were either purchased from Denmark and Norway or built from driftwood or costly imported timber. 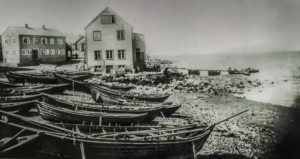 Fishing boats under sail were the backbone of the fleet until quite recent times. Today many fishermen seem reluctant to change out their decades old wood hulls. As a result modern steel wheel houses can often be found sitting mounted on historic wood decks. Two to six man oared fishing boats (Vikin Maritime Museum). My next stop was the maritime museum where, surrounded by model ships, photos and paintings from Iceland’s recent bygone era, I reflected on the thousands of fishermen who ventured out into the frigid North Atlantic. I learned they first went in small two to eight man oared wooden boats; later in small sail boats; then schooners. On an island where climate doesn’t allow sustenance with agriculture alone, in times of poor fishing there was famine. Many historic coastal villages, like Vik and Eyrarbakki on the South shore, were originally just fishing stations. Fish were dried, both for food during the long winter days and for export to Denmark. Survival over the extreme winter months must have depended on those dried fish but, as I learned in the maritime museum, fishermen also took heavy risks in winter to get fresh fish. Mostly that risk was under sail as Iceland lagged significantly behind other nations in motorizing its fleet. At another point in the museum I was stopped dead in my tracks. 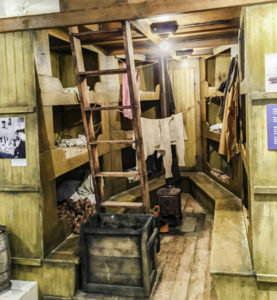 Before me in tight cramped triangular space was the fo’c’sle of a schooner where 12 men lived, conversed, ate, drank and slept during 2 to 3 weeks fishing on the North Atlantic. I knew the fo’c’sle was the roughest, least comfortable place to be in nasty weather. The crew in that fo’c’sle took a beating as the schooner breasted heavily into the waves and lumbered out of the troughs. I could easily see the design of the Icelandic fishing schooners with bluff bows and long overhanging sterns would compound the crew’s discomfort. 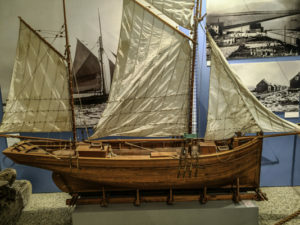 Model of a wood fishing schooner in the collection of the Vikin Maritime Museum. Those craft were best suited for powering into and over steep short seas. The fo’c’sle must have felt like riding an old rickety elevator with quick ups, then floor-drop downs, mixed with unpredictable rolling motions that could easily send the inexperienced green horn careening off his feet. In the middle of the fo’c’sle floor was a small coal-fired stove, the only source of heat to drive away the penetrating dampness and cold. Losing your balance and falling onto that stove would leave an indelible mark. Along each side to port and starboard was a bench for sitting and above it a line of six berths for sleeping. In the museum I discovered that fishing was done when farm work allowed, which unfortunately was usually in the cold of winter and early spring before planting. In thick heavy winter clothing, boots and oil skin rain gear, a man overboard would have a very hard time keeping his head above water. Hard scrabble indeed in a land of hard choices. I imagined many widows waited in vain for their loved ones to come home. I left the Museum with renewed respect for the personal courage of the Icelandic farmer-fishermen. Saga Museum: I found this museum on the wharf near the Maritime Museum. Knowing that without a written history, sagas were the oral history of the Viking settlers and the cultural glue for the far flung farmsteads, it was great fun to see them brought to life in wax figures. Unlike other Nordic countries, the relative purity of the Icelandic oral history has allowed reconstruction of many events, both in Iceland and in the countries from which the settlers came. The wax sculptures depict the arrival of Ingolf Arnarson in Reykjavik in 874 AD, also the discovery of Vinland (The Saga of the Greenlanders) and Erik the Red’s difficulties settling there (The Saga of Eric the Red), as well as, Leif Ericson’s North American explorations (Leifur the Lucky). Many of the sagas, now in historical novels, reflect a deep fatalism that urged pursuit of a courageous life because the end was always close at hand. I felt that ethos must have served the Icelanders well in their difficult environment. Aurora Reykjavik: Located on the wharf near the Saga and Maritime Museums is another space dedicated to the Aurora Borealis- designed to give tourists a January Northern Lights experience in May. The continuous HD panoramic film displays the twilight sky during winter months. While viewing I reflected on what it would be like to be at sea in February fishing in the cold under that eerie Northern lights sky – beautiful or ominous? 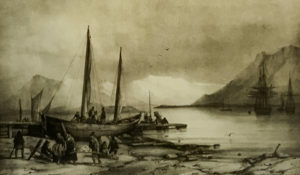 Early etching in the Vikin Maritime Museum depicting Danish traders unloading their wares onto the beach at Old Harbor. Historic Brattagata Street in Old Town Reykjavik. From the earliest days of Viking habitation boats were beached at Gröfin. On the wharf I found a marker that told me Aöalstræti Street was the path from the sea to the old Arnason farmstead, so naturally I took a turn and headed up into Old Town. Now, where once fish mongers and Danish merchants plied their trade, there are quaint boutique wool shops and nautically-themed restaurants. Like the boats in the harbor, buildings in Old Town appear to have been recycled time and again to new uses. Rekjavik Photography Museum: My insights into early life in Iceland were made more dramatic by a visit to the photography museum located on the top floors of the Old Town Library where more than two million historic images are housed. I viewed photos of early farmsteads and their families. The men and women looked rugged, tough and etched by the winter winds- definitely survivors. Icelandic Art Museum:One of the three Reykjavík Art Museums (Hafnarhús) is also located in the Old Town neighborhood. Perhaps because of the gray skies and long winter nights, art has flourished. The museum exhibits works of renowned Icelandic artists Erró, Kjarval and Ásmundur Sveinsson beside those of promising young talents. Shortly after my visit, the museum installed a ten month exhibit entitled “One More Story” featuring the lifelong works of Yoko Ono. For more than four decades now she has been a leading avant-garde artist in a variety of media that is perhaps best known for its union of Eastern and Western arts. The Boardwalk: The Sun Voyager, mounted on the boardwalk, a short walk from Old Town. Perhaps no Icelandic sculpture more appropriately captures the spirit of the city than Solfar (Sun Voyager). Crafted by artisans in stainless steel, the sculpture by Jón Gunnar Árnason commemorates the 200th anniversary of Reykjavik. To me it seemed highly reminiscent of a beached Viking ship faced longingly out to sea, but according to the artist, Sun Voyager is a dreamboat, an ode to the sun offering up the dream of hope, progress and freedom. The highly polished stainless steel seems to reflect both the Icelandic dream and the historical tenacity in a way that fits the people’s spirit. Old Town and the boardwalk of Reykjavik Old Harbor served as a constant reminder that the island colonized by Vikings in the 8th century has survived as a unified democracy for more than 11 centuries. If the strength and spirit of the Icelandic people are any indication, I think the next 11 centuries are guaranteed. 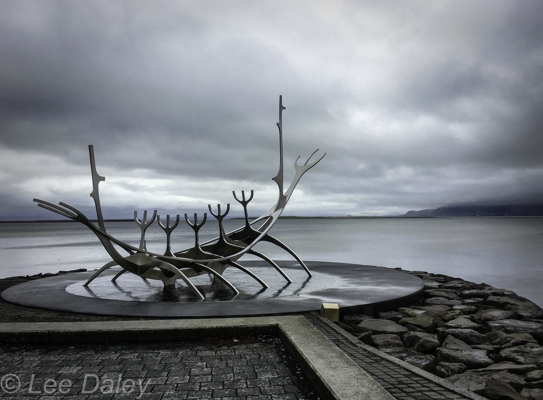 The following resources offer guides to Reykjavik’s Old Town and Harbor along with dining and museum information.